A complete curriculum designed for ages 8-14. Includes both student text and teacher’s activity guide. Over 200 pages, color illustrations included. NOTE: Customers outside the U.S. should order using www.bookdepository.com. 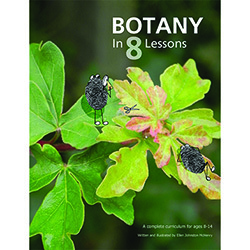 A complete botany curriculum designed for ages 9-15. This book is really two books in one. You get the complete student booklet bound together with the activity guide for the teacher. The audio files that go with this curriculum are listed under the MUSIC tab on the website. About the student text: The 100-page student text has 8 chapters, and each chapter is divided into two levels. All students complete level 1. Students who are younger or who have limited interest may want to stop after level 1. Level 2 provides additional information on the same topic for students who want to read more. You can choose to do some level 2s and skip others. At the end of each level there are review activities such as quiz questions, crossword puzzles, letter puzzles and Internet links that provide videos or online activities. The table of contents is included with the free download of the first two chapters. Supplemental videos: A special channel for this curriculum has been set up on YouTube.com/TheBasementWorkshop. It contains videos that correlate with each chapter. Most videos have been embedded from other sources, but a few were created specially for this curriculum. All videos have been thoroughly previewed. How long would it take to complete this curriculum? Probably a minimum of 5 to 6 weeks if you really raced through it, and more like 7 to 8 weeks if you go at a relaxed pace. You could even stretch it to 9 or 10 weeks if you added in other activities (gardening, field trips, etc.) It really depends on how many hours per week you spend on science, and how long you spend on each activity. Some students might want to play the games multiple times, or spend extra time on their art activities. You can make this curriculum fit your schedule. –Can I just pull out what I need and not do the entire curriculum? Sure. You can combine parts of this curriculum with another curriculum, or a batch of library books, and create your own super-unit! –Would it be possible to use this with kids older than 14? The content is basically “high school biology,” so yes, you can. If your high schooler still likes entertaining writing and lots of activities, you could use this for high school science credit. –Can I order this product on Amazon? 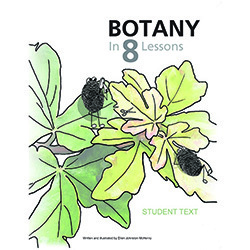 Yes, just type in “Botany in 8 Lessons” and you can order it on Amazon. This might be convenient for you if you are ordering other books on Amazon and want to use your free shipping option. Extra students booklets are also available on Amazon.